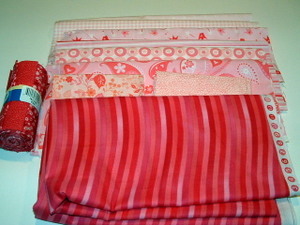 First up today is a look at some fabric I got last week. This is the fabric that has been haunting me for the last few days and the top I’m making out of them is nearly complete. I may just leave you with this tease for awhile before I show off what has come of all this pink. And yes, it is a LOT of pink. I have mentioned before that I am calendar challenged. I have trouble using calendars. I’m sure some of you are wondering how it is possible to have trouble using calendars — and if you are, I wish I were more like you. Others of you might know what I mean. I put stuff on my calendar, but if you don’t look at the calendar, it doesn’t matter if the information is there or not. in the shower, while I was driving the boys to school. phone rang at 9:45 and I knew instantly who it was and what I had done. Thankfully, I live about 2 minutes away and they were still able to fit me in. order to remind myself that I needed to remember something. Do you think I would actually remember why the string was on my finger, though? My thrift store finds from last week. I also got a pair of khaki carpenter’s jeans that are a perfect fit and are in brand-new condition. The upper right is a denim dress which is a little big, but I liked the back detail and the buttons down the side. I don’t know if I’ll embellish it or not. The sweater below it is prettier in person — it’s a dark purple on the top. The denim skirt is really cute and fits perfectly — the back is actually shorter than the front and I really like the ruffle detail. I will probably alter the skirt in some way (some day). 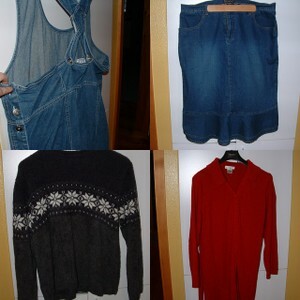 The red sweater is another one that I don’t know what I’m going to do with it. I’m wearing it today and I like it, but it is a terrible string magnet. Or maybe it’s just because the strings are all pink and white today and they are terribly obvious…. I should also mention that while my dentist didn’t find anything wrong, it sure felt like he was scraping off all of the enamel on my teeth today. My mouth still feels a bit raw and achy. It matches the bruised spot on my back side where I stood up into the side of my quilting machine table over the weekend. Ouch. That’s what I get for vacuuming, I guess. You got this fabric a week ago and you are almost finished with the top? How do you do that? I always thought that fabric needed adequate time to adjust to the indoor environment and that it could take years! Isn’t it dangerous to use fabric too quickly? Hahaha – I am so with you and do the same things! I even bought a PDA to beep at me in advance so that I could still remember stuff. Do I remember to charge the PDA? NOOOO so all the stuff erases out and I still don’t have something to beep at me. Isn’t it dangerous to use fabric too quickly? Isn’t that funny?? I understand completely about the calendar; although, it doesn’t happen to me much (yet). I wanna see the PINK!!!!!!!!!! !